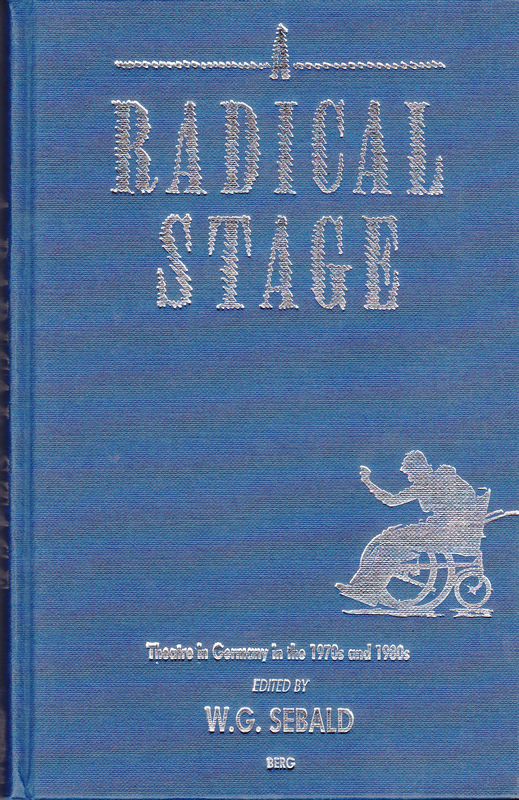 A Radical Stage was reprinted in 1990. Evidence at the publisher’s website suggests that a 1992 edition is still in print as of January 2007 ($84.95 in the U.S.) and, unless the brief bibliographic information given at the site is in error, the newer edition might even be an expanded one, since it is listed at 256 pages rather than the 196 pages of the 1990 edition which I own. One of these days I’ll have to spring for the 1992 edition and see for myself. In his introductory remarks to A Radical Stage, Sebald notes that the first fifteen years of the Federal Republic (1948-1963) represented a period of “collective amnesia” (a topic he takes up at greater length elsewhere) and that “West Germany’s contribution to dramatic literature is insignificant, if not non-existent” (page 1). On the other hand, he notes, “the dozen or so years from 1968 to the early 1980s were among the most inspiring in the history of twentieth-century German theatre” (page 3). Sebald also offers an intriguing statement on aesthetics: “The more successful a production is in artistic terms, the more likely it is to conceal the conflicts which new theatrical vision. Perhaps this is one of the laws governing the relation between ethics and aesthetics” (page 4). Although he was speaking of the theater, the statement has wider implications for Sebald’s own writings and for his critical stance toward various German writer. Sebald’s own paper discusses Herbert Achternbusch (about whom he had written earlier in a 1983 issue of Manuskripte. “Achternbusch’s plays – if plays are what they are – could perhaps be described as theatre brut” (page 8). Even though – or perhaps because, – “Achternbusch certainly has no great theatrical talent in any traditional sense” (page 175), Sebald is drawn to him on several levels. He speaks of Achternbusch’s “memories of the Bavarian forest, of a nature supremely indifferent and unaffected by our antics,” a theme Sebald takes up himself, especially in The Rings of Saturn. I sense another nugget of Sebald’s own interests in his comments on the difference between memory and remembrance in Achternbusch’s theater (see particularly page 181). Sebald likens remembrance to mourning rites “which take the present into the past” instead of evoking past in the present. Additionally, Sebald’s interest in Achternbusch’s un-theatrical theater seems not unlike his apparent admiration for the “naive” poetry of the schizophrenic Ernst Herbeck, who Sebald visits and describes in the opening pages of the “All’estero” section of Vertigo. Even though the title found enough of a market to go through three editions, A Radical Stage is now actually one the hardest books of Sebald’s to locate. Frequently, there is not a single used copy available anywhere on the Internet, even though Abebooks alone usually has more than 1,000 entries of books for sale by Sebald. I have only seen the 1990 edition, which comes in a basic blue cloth with silver-stamped text and cover design. I am not aware of a dust jacket for this title.